a place of worship since 1769. Services at 10 AM every Sunday. Worship and holy communion followed by a time of fellowship. All are welcome. See photos from the service welcoming our new pastor, Rev. Mark I. Salvacion. Museum and archives are open 10-4, Tuesday through Friday. Saturday group tours are available by appointment. 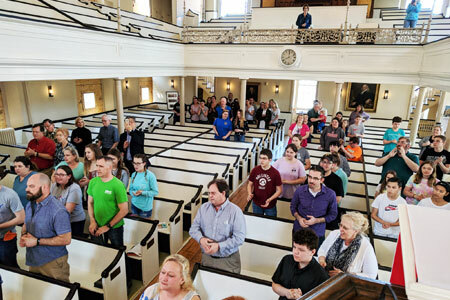 Through reenactments, puzzle-solving and music, students learn Methodist history in a hands-on environment. Offered three times a year; reservations required. Restorative Yoga meets every Thursday from 6:45 PM til 8 PM. All Levels Yoga meets every Monday from 6:45 PM til 8 PM. Brittany Largent, instructor. Free will offering with proceeds going to local hunger programs. Mats and blankets provided. Come and meet our pastor. NEW! YOU CAN NOW VIEW "SACRED HARMONY", the first Methodist Hymnal published. We have scanned images of the copy belonging to John Wesley.